In Hostage Negotiator, you play the part of a law enforcement agent responsible for negotiating the release of hostages taken by an unscrupulous figure hell-bent on having his or her demands met. Each turn in the game represents a conversation between you and the hostage taker. You'll play cards and roll dice to increase conversation points, decrease the threat level, and release hostages. Hostage Negotiator uses a unique "hand-building" mechanism that puts cards you purchase directly in your hand for next turn rather than leaving you wondering when the cards will show up like in deck-building games. 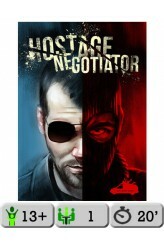 In Hostage Negotiator there are multiple paths to victory, but the hostage taker has other plans. Will you try to calm him and get him to surrender? Will you stall and bide your tim..